It has been nine days since my last article… I try to get a blog post in every other day or so… However, this skipped time was warranted, because I was spending time preparing for the exciting meetings that I had in Annapolis with the rest of the Hemophilia Foundation of Maryland (HFM) peeps. It was our goal to meet with many of the Maryland House Delegates and Senators to discuss the “Health Insurance – Specialty Drugs” bill (House Bill 761 and Senate Bill 874), inform them of the bill and how it will be beneficial to the hemophilia community (and rare chronic disease communities in general), and to ask each of our representatives to please vote “yes” on the upcoming bill. I was recently elected to the HFM board of directors as one of the advocacy chairs. These meetings with state and federal representatives is just one piece of my role as a hemophilia advocate. And, like everything else in my life, I dove in head first! 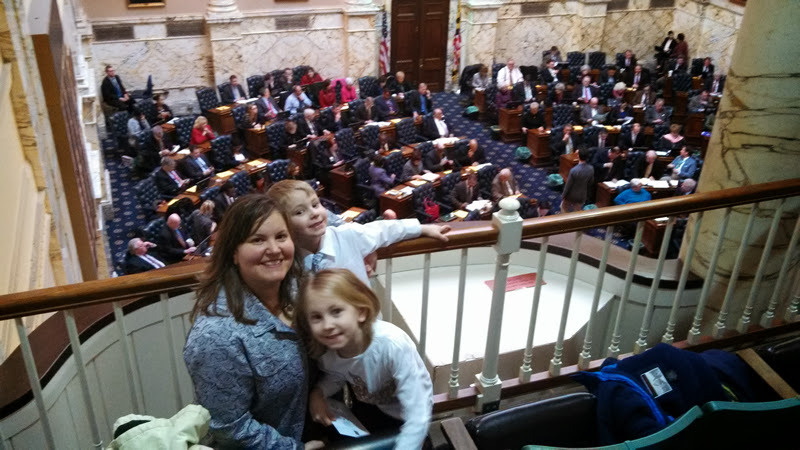 Monday, February 17, 2014 – My wife Kristine and I piled our children (Trinity and Xander) into our car and drove the 90(ish) minutes to Annapolis. We arrived and checked in at the Historic Maryland Inn of Annapolis on Main Street. This is a gorgeous hotel that throws back (literally) to the 17th and 18th centuries. The elegance and ambiance is immediately heart warming and downright awesome! Our room was spacious and beautiful. After dropping our bag in the room, we headed downstairs for lunch with our fellow easy bleeders (hemophiliacs) to discuss politics and our plan of action. HFM and a few important sponsors did a fantastic job of supplying us with information packets (for ourselves and the representatives we would visit), providing food and fun, giving us some role-playing examples of how our meetings would go, and covering any additional questions we had. Let the nerves start to tingle and the sweaty hands begin! After the informative meeting, we broke for a few and then went for a fantastic dinner at Buddy’s Crabs & Ribs (an Annapolis staple). Along the trek to Buddy’s, we passed an alley that had a perfect (and serene) view of the Maryland State House… Trinity and Xander were kind enough to pause and pose with this historic monument and achievement. After dinner, we waddled back up the little hill and entertained ourselves by reading over the materials that HFM provided. Before long, our lights were out and we were sleeping soundly… Until… 1:17 a.m. when Xander suddenly kicked out (he was upside-down in his bed) and knocked the phone off the bedside table. I put it back up, hung the receiver up, spun Xander upright, and climbed back into bed. Just before sleep hit me again, Xander suddenly kicked the phone off again… How the heck did he get spun upside-down again?? Deja vu all over again and then back to sleep. The next morning, Xander told Mommy and me that he had a great dream about Ninjas attacking our family and he protected us by kicking them in their “parts.” Ahhhh… I see… The phone was a ninja’s parts. Now it all makes sense. Xander is five by the way. HA! Lest this long night be over, Kristine and I were both awakened at 3:09 a.m. to the beeping of a truck in reverse. WTH? I decided to drain myself of last nights iced teas and waters and take a peek out the window. Low and behold, it was snowing… There was a snow plow out there, moving back and forth and beeping along the way… Great. hehe. It honestly felt like that truck stayed below our window and stuck in reverse for two hours. Perhaps there is a little bit of irony in this story as I think about icy cobblestone streets and brick sidewalks that were recently covered with snowfall. Now picture a handful of hemophiliacs walking said streets and sidewalks. HA! The things we will do to get a vote! Tuesday, February 18, 2014 – Waking bright and early, we joyfully bounced around the room preparing and packing. A quick shower, shave, and so on and so forth… Soon, I had on my fancy-dancie blue suit (complete with U.S. flag lapel pin) and we were off running. Downstairs we enjoyed a brief breakfast, and then made our way to our first meeting at the Senate building. 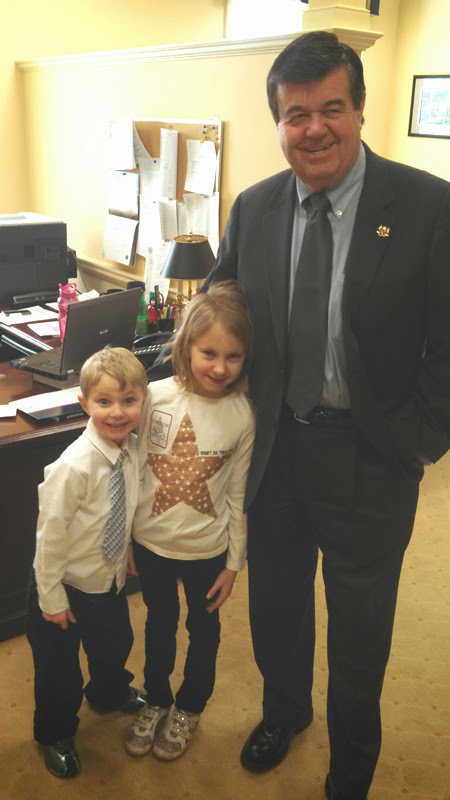 Kristine, Trinity, Xander, and I started our day by meeting the Honorable Senator Ronald Young. Firstly, I honestly was expecting to only meet aides… And, it started out looking like we would. The Senator’s aides greeted us, and explained that he was about to leave for the Caucus assembly and he would not have time to see us. However, he overheard us chatting and came out with a smile on his face. Senator Young was very polite and personable. He listened to our story intently. and when we finished he said, “I will absolutely vote yes on this bill.” YAY! Next, we crossed Bladen Street and entered the House of Delegates. We were early, so we dropped off three information folders for delegates that we didn’t have appointments with. One of these aides we met with previously worked with a congressman (I think from Minnesota or Michigan) who had three hemophiliac boys. She was very helpful and said she would not only hand off the folder, but also push our point with the delegate. Another win! 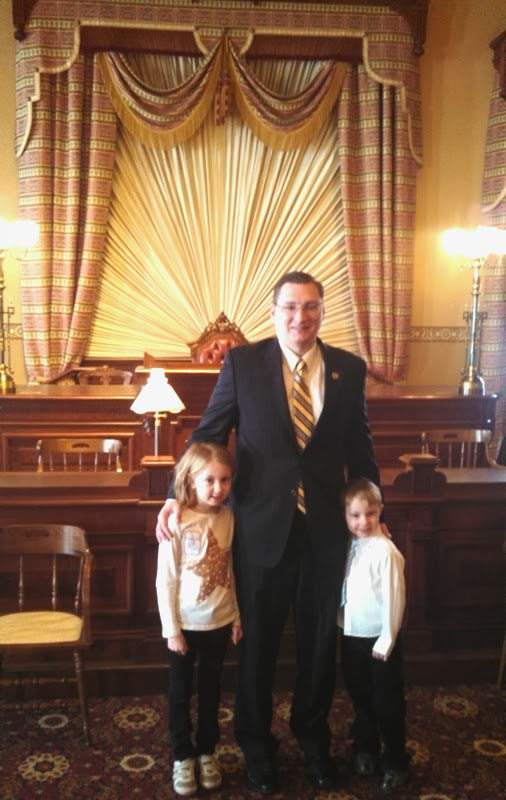 Our final face-to-face was with the Honorable Delegate Michael Hough. It turns out that he is our neighbor, and my wife is actually friends with his wife, Jo. When we first arrived, his aide said that Hough was in session and not available for a meeting. He was kind, sat with us, and said he would pass the info packet on to Delegate Hough. Just before we left the meeting, my wife said, “Mike lives in our neighborhood, and I’m friends with his wife.” This had a very big impact on the aide, and he immediately texted Hough. Moments later, he announced, “Delegate Hough is going to be out of his session with a few minutes to spare before the Caucus and he would very much like to meet your family.” WOW??!! Delegate Hough was truly awesome and kind as he not only met with Kristine and me (and our kids), but he took time out of his busy schedule to walk us over to the State House and give us a guided tour! He actually walked us through some of the history of the building and told us stories about Washington, Hamilton, and Franklin while walking us into various rooms. We literally got the behind the scenes tour filled with neat tidbit of history. He took us into the original House of Delegates room; which was recently renovated. In here he took another fun photo with the kids. By now, they were really enjoying themselves and learning so much about our country and the way the government works. Delegate Hough also showed us the resignation letter of George Washington with a twinkle in his eye. It was incredible awe inspiring and very positive! As we parted ways, he explained to us how we could go up above the Senatorial and Delegate meetings and view them from a balcony. I never knew that we (the public) had so much access, but I learned just how high these representatives hold us, their constituents. All-in-all I would call this trip a huge success. And, an incredibly strong learning session to boot! We met a Delegate and a Senator. We met dozens of aides. We told our story and the story of H.B. 761. We asked for a “yes” vote from everyone. We passed out five information packets. And, I gave away three signed copies of my book, Survivor. Always be completely prepared for meetings with representatives. Study their CV, know the names of their aides, and plan some alternate conversation points, should there be contention. Know what your point of contact looks like, in case you run into them in the hall, rather than their office. Arrive early! The only reason that Senator Young had a few minutes for us, was because we were ten minutes early and caught him on the way out the door. Be confident and well-read. Leave them feeling as though you are someone who carefully studies the issues and also someone who votes! Don’t be afraid to bring your children (if appropriate). Trinity (nine years old) and Xander (five years old) were a bigger hit than me and Kristine. 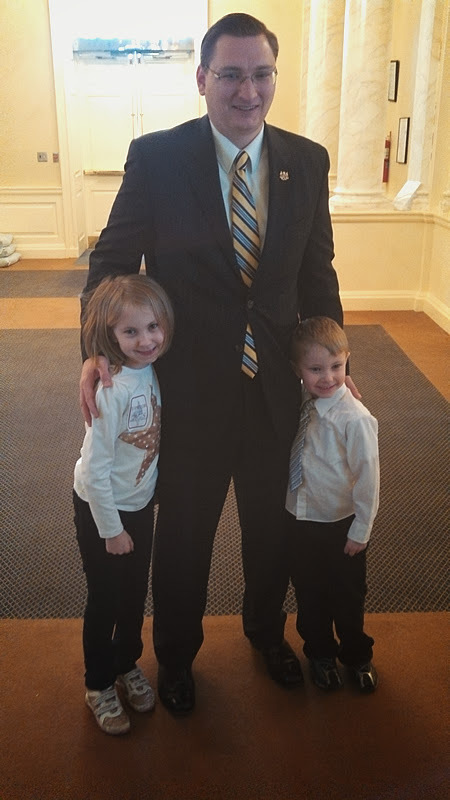 All of the aides loved them, and the representatives were delighted to take photos with these youngins. On top of that, the learning experience for these children was immeasurable! Enjoy yourself and be stress-free. This one may be tough for some, but it is well worth it to approach these people as peers (and actually employees), because they are. We often put them on a pedestal and think they’re impossible to reach. Nothing could be further from the truth. Everyone I’ve ever met has been extremely nice and listened and talked openly and in a friendly manner. Before you part ways with your representative(s), ask for their support, and ask for a “yes” vote. You will be surprised how polite and honest these folks are! I hope you dug this article. And, perhaps even gleaned something from it. We often hear statements like, “Oh yeah… Well you should try walking in my shoes…” Today, I’d like to offer my shoes and allow you to see through the eyes of a hemophiliac. Let’s start off by explaining what the heck hemophilia is. Hemophilia is a rare bleeding disorder in which your blood does not clot normally or properly. It is carried in the X chromosome, and is called an X-linked genetic disorder. Cutting through all of the obfuscation, it essentially means that I inherited a factor VIII (factor-8) deficiency from my mother, who was a carrier. Dumbing (is that even a word?) it down even further, it means that unlike average boys and girls, if I get bruised or cut, I will not stop bleeding without medical assistance. My disclaimer: While I have lived with this confounded disease for 46+ years, I do not claim to be a medical professional nor someone who even knows what the heck he’s talking about. I am a mere mortal who loves sharing information. I am often wrong, and for that I apologize. I try to investigate and ensure that my data/information is correct, but as is always the case, I am bound to be wrong about something. At the least, I probably will have a misinterpretation or two in here. So, seek the advice of a medical professional if you are planning on writing a report on my post. Also, I do not necessarily condone some of the things I did and am not in any way suggesting that hemophiliacs should avoid listening to their parents and doctors. I am merely pointing out that I did some things and got away with them. Carry on! About a generation or two ago, science made some huge breakthroughs with the hemophiliacs, and we created products based on blood donations called plasma, cryoprecipitate, and factor VIII that could temporarily turn an “easy bleeder” (my term for a hemophiliac) into a normal clotting person. This technology added years even decades to the longevity of hemophiliac. It also made it possible for us in the bleeding community to participate in more normal activities and sports (to some extent). I should mention that there are different types of bleeding disorders and they do not all use factor VIII to stop the bleeding. But, for simplicity’s sake, I went with what I am (type-A). During the early years of this modern medical miracle, hemophiliacs were unfortunately hit with several life-threatening blood-borne pathogens, diseases, and viruses. Among these were HIV and Hepatitis. Because I am the lucky one, I got both of these. You heard me right… I said, “Because I am the lucky one.” I do consider myself lucky, because were it not for the advent of modern medical science I would have died from a bleeding issue years ago. As I’m sure you can imagine, the life expectancy of hemophiliacs was very short prior to the 1950’s (I believed the average death occurred by eleven years old back then). This is one of the reasons that I feel lucky. I also feel lucky in that I am only a mild hemophiliac. Whilst at hemophilia camp back when I was thirteen I had the pleasure of meeting many hemophiliacs that were not as lucky as me. One was in a padded wheelchair because his ankles and knees were so bad off that he would have bleeding episodes from simply walking. In addition to the technology and mildness, I also feel lucky because of the awesome support system that is now available to hemophiliacs. Not only do we have the World Federation of Hemophilia, National Hemophilia Foundation, Hemophilia Federation of America, and state groups (I am a board member for the Hemophilia Foundation of Maryland), we also have hemophilia camps (I went to Bold Eagle), support groups, discussion forums (I’m a huge fan of HFA’s Blood Brotherhood Forum, and online services galore. And, as if that wasn’t enough, we easy bleeders are also surrounded and supported by loving family and friends! Now you can see why I feel lucky. Now that I convinced you that I’m lucky, we can dabble in a few of my unlucky areas. When I was a kid I was regularly picked on and even bullied. A few of the more obstinate bullies even punched me exclaiming, “I wanna see you swell up!” And, they called me names like: homo-feel-ya or something similar. It was often brutal, but it also taught me how to calmly take these attacks and live despite them. So, in some weird way, the bullying also strengthened me. I was very sheltered by my mother as I grew up. I fear that some of this may have been the cause for my dramatic outburst as a teenager when I started doing things I shouldn’t have (like playing football with neighborhood kids and skateboarding). However, I know that she was worried about me, and wanted me to be safe. The funny thing about this protection and my adrenaline-based extracurricular events is that I often sustained some serious bleeds while being “safe.” As a matter of fact, the very most damaging and worst bleeds occurred while playing at camp Bold Eagle (with other hemophiliacs-and being safe), getting my wisdom teeth pulled, and, of all things, having my toe lanced to cure an ingrown toenail issue. So, avoiding contact sports and other dangerous habits was not my only nemesis. As a bleeder, I was acutely aware of the fact that I was susceptible to all manner of painful bleeds. If I have learned one very important thing, it is something that ALL of us should learn (bleeder or not). That is, our choices have consequences. That statement is so important, that I will repeat it, “Our choices have consequences.” And, it is our responsibility to choose wisely. Actually, I love the word responsible. I prefer to break it down and say it like: response able. In other words, each of us is able to respond. Thinking like that might save lives! Now that I’ve put the fear of a slow and painful death by horrible bleeding episodes in you, let me leave you with a parting note… Live life! You heard it from me… As long as you realize (honestly) that there are consequences for your decisions, and you weigh those consequences carefully thinking about the future and how it will affect you, I think you should do whatever you want (please read the above disclaimer). I may not necessarily be the best role model for fellow hemophiliacs, because at some time or another I have rock climbed, raced motorcycles, and skateboarded (among other deadly things *insert dastardly music here*). However, I am still here. I’m still here because I’m lucky… But, I also create some of my luck through careful thought and recognition of what I’m doing. I guess what I am saying is, be response-able with your choices! I hope this article touched a nerve. And, I sincerely hope I helped in some way. If you aren’t a hemophiliac, then maybe this opened your eyes a little bit. Do you want to win a COo.oOL prize? 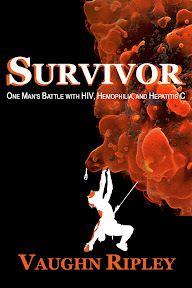 I’m giving away a $67 Amazon Gift Card and a signed copy of my book, Survivor: One Man’s Battle with HIV, Hemophilia, and Hepatitis C at the end of March. March is Hemophilia Awareness Month, and I decided to run a contest/giveaway to support Hemophilia Awareness, give back to my friends, and gain blog followers at the same time! It’s easy to enter and I will draw one lucky winner from the contestants on Monday, March 31, 2014. In order to qualify you simply need to subscribe to my blog. Subscribing is easy and I never SPAM my followers. Subscription to my blog will simply get you an email anytime a new blog article appears on the Healthy Wealthy Tribe blog! You will find the subscribe entry at the top or right side of this blog. Type in your email address and hit the “subscribe” button. That’s really all there is to it! If you are already a subscriber, then you are already entered! Thank you for your support, friends! Note: You must enter by 11:11 p.m. EST on Saturday, March 29, 2014. Also, see the “fine print” below for contest rules. Only one (1) winner will be selected for this contest. Vaughn Ripley reserves sole and final judgment as to all matters concerning contests and interpretation of contest rules. No purchase is necessary to enter this contests. Contestants must be 18 years of age or older and a legal resident of the USA, Canada, UK, or Australia. Entries must be sent using the format provided above. All entries must be submitted on or before 11:11 p.m. EST on March 29, 2014. The winner will be randomly selected on March 31, 2014. The odds of winning vary due to the number of entrants. The drawing winner will be notified via Tweet, Facebook message, and through announcement on Vaughn’s fan page. The decisions made by the judge (Vaughn Ripley) regarding this contest are final and binding. If a winner cannot be reached after a reasonable amount of effort has been made to notify the winner of the prize, the winner forfeits his/her rights to the winning prize. If a winner does not get in touch with Vaughn Ripley within 21 days of winning, the winner forfeits his/her prize. Vaughn Ripley assumes no responsibility to ensure winner response. No purchase necessary. Void where prohibited by law. All decisions of Vaughn Ripley are final. By entering, participants warrant and represent that they agree to be bound by these contest rules and the final decisions of Vaughn Ripley. All taxes on any prize won are the sole responsibility of each winner, including, without limitation, any federal, state, or local taxes, which may be deemed applicable in such winner’s jurisdiction of residence. The winner shall be solely responsible for the reporting and payment of all taxes incurred by acceptance and use of the prize(s) (or any portion thereof), if applicable. All prizes will be mailed to participants free of charge. Delivery method is at the sole discretion of Vaughn Ripley. Vaughn Ripley reserves the right to cancel contests at any time for any reason. Vaughn Ripley reserves the right to modify the dates and/or terms of contests at any time without prior notice. Prizes are offered “as is” with no written, express, or implied warranty. Vaughn Ripley is not responsible for late, lost, illegible, misdirected, mutilated or incomplete entries. Anyone using fraudulent means to participate and/or win the contest will be disqualified. ANY ATTEMPT BY AN ENTRANT TO UNDERMINE THE LEGITIMATE OPERATION OF THE CONTEST MAY BE A VIOLATION OF CRIMINAL AND CIVIL LAWS. VAUGHN RIPLEY RESERVES ALL RIGHTS, INCLUDING THE RIGHT TO SEEK REMEDIES AND DAMAGES (INCLUDING ATTORNEYS’ FEES) FROM ANY ENTRANT ATTEMPTING TO DO SO TO THE FULLEST EXTENT OF THE LAW, INCLUDING REPORTING SUCH ACTIVITIES TO THE APPROPRIATE AUTHORITIES WHICH MAY RESULT IN OR LEAD TO CRIMINAL PROSECUTION. Acceptance of prize constitutes permission to use winners name, city, state, and country for promotional purposes. Contestants agree that the sole and final judgment as to all matters concerning contests and interpretation of contest rules are at the sole discretion of Vaughn Ripley. Whew! Now that the disclaimer is out of the way… Let the games begin!